This afternoon my old friend Martin Anderson and I set out for Málaga to record some music that I never thought I would ever hear in my lifetime. My Symphony No. 1 was written between 1967 and 1969, when I was straight out of college and a member of the now defunct BBC Training Orchestra in Bristol. It’s very much the music of a young man searching for an individual voice and, in the forthcoming week, I am to hear it played for the first time, 50 years after I began it. My Symphony No. 4 was written seven years later and, despite an unsuccessful attempt by Sir Charles Groves to programme it in a BBC Symphony Orchestra concert, the piece has remained unheard for over 40 years. 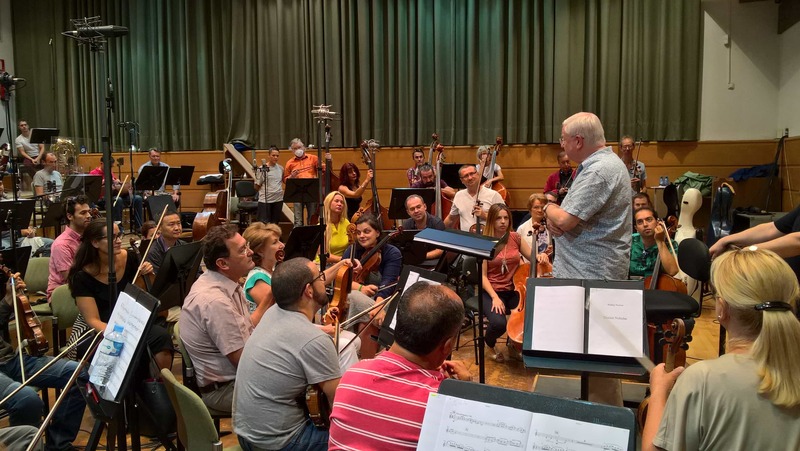 I’m quite apprehensive, not knowing how the orchestra, the Málaga Philharmonic, will react to what will be for them, unfamiliar music by a composer of whom none of them will have ever heard. Martin and I leave the cold, damp world of Luton Airport to arrive two-and-a-half hours later in the brilliant sunshine of Málaga. 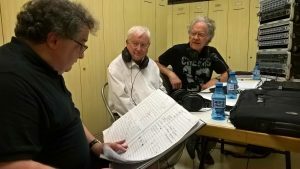 I am staying at the Hotel Don Curro in the centre of the town with our conductor, Paul Mann, with whom I have been collaborating over the production of the orchestral material, and whom I met in person for the first time last week, at the launch of the recording of Steve Elcock’s Third Symphony. 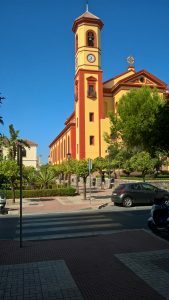 Martin is staying at a hostel next door to the home of the Orquesta Filarmónica de Málaga, opposite the church of San José Obrero, which is a ten-minute taxi ride away for Paul and me. We are not working this evening, so I spend the time relaxing and getting acclimatised to the warm weather. There are lots of restaurants and tapas bars in the vicinity of the hotel, so we certainly won’t starve! 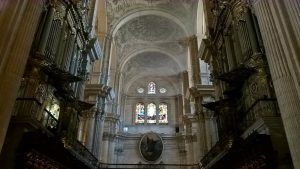 The two double-sided organs in Málaga Cathedral. A free morning and a post-breakfast saunter around the area. 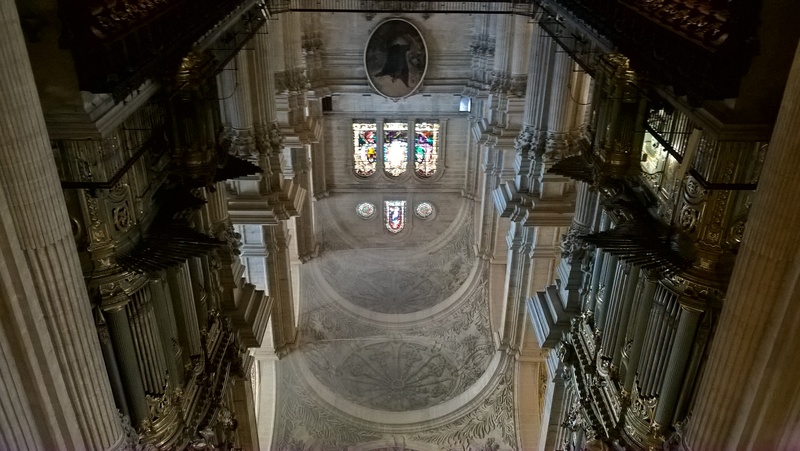 I visit the mediaeval cathedral, a very imposing building with a lofty campanile. Mass, celebrated in Spanish by an elderly priest, is starting in a chapel at the east end of the building, flanked by the twin ranks of pipes of the magnificent organ. A lady is playing an accompaniment to the sung responses and it sounds beautiful. Around the perimeter of the cathedral are a number of chapels, and one, dedicated to the Blessed Sacrament, has an altar of solid silver. I return to sunbathe on the veranda of my hotel room. 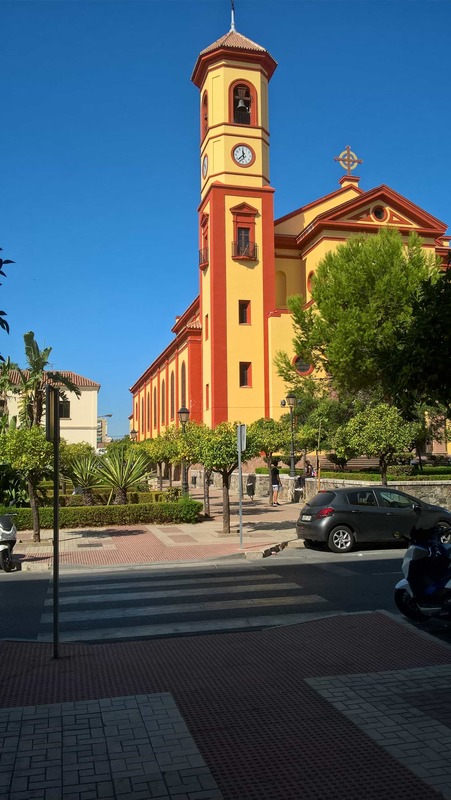 After lunch, we summon a taxi to take us to our first three-hour recording session which takes place from 5.00pm until 8.00pm (no work is done in the afternoon owing to the customary Spanish observance of the siesta). Conductor, composer and producer – Albert Moraleda – in discussion. Paul has wisely decided to record my Fourth Symphony first, since it is much more difficult than my First. I am consigned to a small area of the mens’ locker room which is serving as a control room. Here I meet Albert Moraleda, a genial middle-aged man who is our producer-engineer. His English isn’t perfect, but it’s good enough for us to form a good relationship. We also meet the orchestra first the first time and begin the Symphony at the beginning, the players easing themselves into the unfamiliar music. At the break, an English trumpet-player approaches me – he, Steven Craven, is the cousin of my old friend Richard Marshall, principal cornet of Black Dyke Band. Eventually the first movement is in the can and Paul, Martin and I head off in a taxi for the centre of the town and a meal. 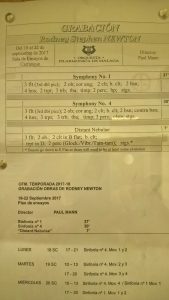 Tomorrow morning Paul intends to record the opening of the Symphony again, as well as the very end of the fourth movement which is based on the same material. The celeste player is used in these just these passages, as well as in a little flourish at the end of the scherzo, and he doesn’t want to keep the musician hanging around all day to play a few bars (good psychology!). This morning’s session goes very well, and we get the feeling that we seem now to have earned the orchestra’s trust so that it’s on our side and trying its collective best to get things right. The re-recording of the opening of the first movement of No. 4 goes well, as does that of the end of the Symphony. The second movement presents few difficulties and everything is done and dusted by lunchtime. In the evening, things pick up a bit, but now the players are faced with the very tough, highly chromatic Scherzo malevolo. The musicians gather their energy and tackle the demanding, Shostakovich-inspired music with serious intent. I get the impression that they are warming to Paul, respecting his professionalism and ear for detail (our producer, Albert Moraleda, is remarkable in this respect, often detecting flaws in the playing that I have missed). I remain out of the way in the stuffy control room with a pair of headphones on, sustained by bottles of water and Martin’s Fisherman’s Friends (by heck, they don’t half clear your sinuses!). As a recording musician myself (and a former player and TV musical director), I feel strongly that the composer should keep out of the way of the conductor and producer as much as possible, allowing them to do their jobs without additional interference. We celebrated with a slap-up meal afterwards, Martin and I sharing an enormous whole halibut. This morning we are still wrestling with the nightmarish scherzo. Gradually, the players get to know the music and things start to fall into place. At the climax of the scherzo, there is a big solo for a kit drummer. The Russian percussionist designated to this part is a little apprehensive as to how to approach it, but I suggest he imagines himself to be a heavy metal rock drummer, that he ignores the written cadenza and just does his own thing for seven bars (after which he will be silenced by a loud tutti chord from the full orchestra). ‘Iron Maiden!’ say I: ‘Jethro Tull!’ says he, and I get exactly the effect that I want. The easier finale follows and that goes quite smoothly, the recording of the entire Symphony being concluded before lunch. This Symphony, written when I was a percussion player at English National Opera, has lain in storage for over 40 years, since its rejection by Robert Ponsonby, the BBC ‘Controller, Music’, and the effectiveness of what I have heard over the past two-and-a-half days justified the support and encouragement given to me and the work by Sir Charles Groves, its dedicatee Robert Simpson, Sir Edward Downes and Sir Lennox Berkeley. It is a real pity that none of these old friends and acquaintances are still alive to hear it; at least I still am. The orchestra finds the Vaughan Williamsy slow movement of my First Symphony very much to their taste, and the solemn Romanian co-leader pats me on the arm, grins for the first time and says, ‘Very good!’ The violin solo at the end of the movement was recorded by Andrea Štestaková separately at the end of the session and a very good job she makes of it – unsurprisingly, since she had been a pupil of Leonid Kogan in Moscow. During the afternoon break, I am invited to lunch by the co-principal percussionist, Russian-born Yuri Chuguyev, who has a parallel career as a restaurateur (he owns three!). I am treated to a delightful meal, during which we are joined by a former mayor of Málaga and minister of culture. The finale, recorded during the evening session, gets off to a good start and most of it goes swimmingly, apart from a few places that require a little more attention. It is a very strange feeling, hearing music that you wrote around 50 years ago, recalling the hours spent hunched over the manuscript score in my little bedsit in Bristol, wondering if the piece would ever get finished, let alone played. It was gratifying to hear that my orchestration worked and that the various effects came off, confirming that, even at that early stage in my development as a composer, I seemed to know what I was doing. I never had lessons in orchestration nor in composition beyond the practice of Mendelssohn while at college, teaching myself more advanced practices and techniques with the aid of scores and the music I heard all around me in the orchestra. In the break, I fall into conversation with the other Brit in the orchestra, the co-principal oboe, who turns out to have studied at the Royal Academy of Music with my old ENO colleague and friend Judith Thomas, who was one of the finest cor anglais players I’ve ever heard. It was a nice link with my orchestral past. The final morning session is given over to the seven-minute tone-poem, Distant Nebulae, which I wrote in 1978. I conducted the first performance of the work myself in London, but shortly before this recording I revised it. Martin correctly identifies Ives’ The Unanswered Question as the inspiration behind it – ‘Ives edited by VW and Hovhaness’, as he cheekily puts it. I spend the afternoon relaxing in the sunshine before a dinner engagement with Yuri Chuguyev and his wife, Katia, at the same restaurant at which I lunched yesterday. During the evening we are joined by Pedro Ignacio Altamirano, president of the Andalusian National Assembly, and his wife. As I prepare to depart at around 9.30pm, we hear the sound of a band. Just up the street a religious procession by torchlight is taking place, accompanied by a full marching band. Since I am quite short, Yuri (who is over six feet tall) grabs my mobile phone, activates the video application and films the procession for me: quite an end to the evening. Our Spanish adventure over, Martin and I depart for the airport. It has been quite an experience, working with a Spanish orchestra new to me and my music and hearing works that had lain unheard on paper for so long. I hope the orchestra would be pleased to see me again. 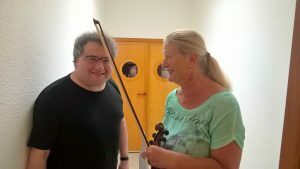 The Russian principal viola, Dunia Ershova, asks if I have anything suitable for a viola ensemble that she runs; I do, and will send it to her in due course. And so who knows? I might be back again some day with something else. Rodney Newton was born in Birmingham in 1945 and is a professional composer, arranger and music consultant. 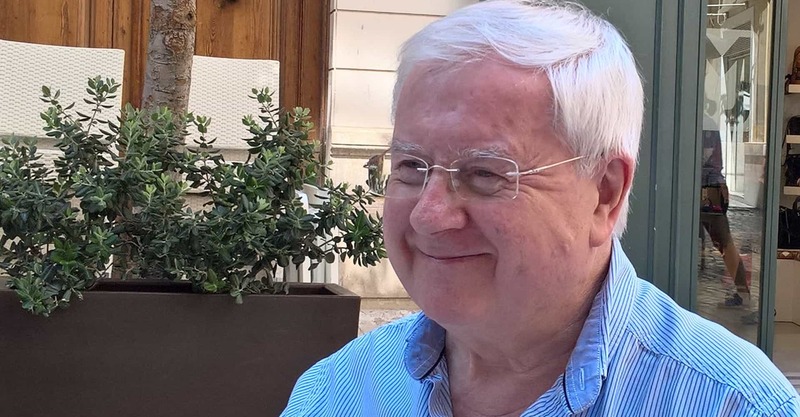 He has worked in films and television and is best known for his compositions and arrangements for brass and wind bands, although there is also a substantial body of orchestral music written between 1967 and 1979, including eight symphonies. A great read, Rodney, and congratulations on two of your symphonies being recorded at last… one more composer among the legions who owe thanks to Martin. 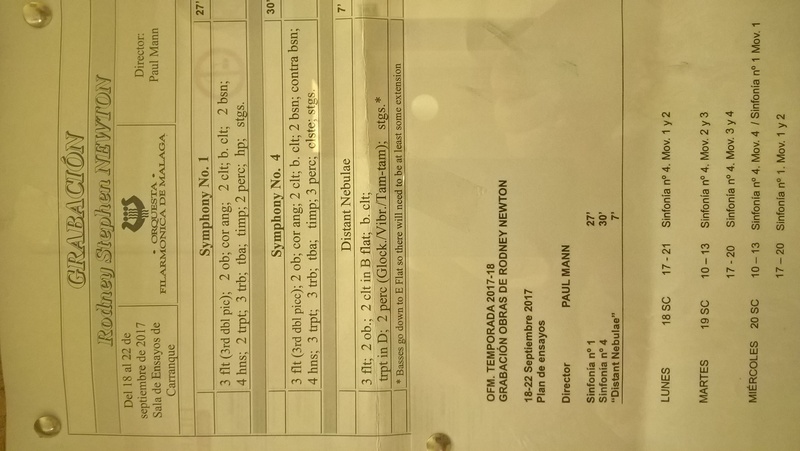 I still have a photocopy from many years ago of the score of your Fourth Symphony, so I look forward to following it through when I get the CD. How could one ever have guessed that you would have the work recorded in Málaga, and I would be listening to it in southern California! Your timing on it was 48 mins, so I guess that it will be a well-filled CD. You couldn’t have had a better collaborator than Paul, as I know from personal experience having worked with him on the complete Nixon orchestral music. Thanks David – it’s wonderful hearing from you after all these years. If you follow the recording with the score you have, you’ll find that I’ve made a few alterations (I always try to improve things before a recording takes place and ‘sets a piece in stone’). 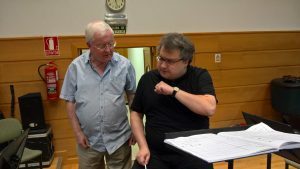 Martin deserves full marks for believing in this music, as do you and Lewis Foreman, who has promised me a couple of pages in his forthcoming book in the British symphony. I visit California fairly regularly – I’ve had world premieres of brass and wind band pieces in Fullerton and Pomona and given talks at universities and colleges in La Mirada and Pasadena. If you let me know where you now live, perhaps we could meet up next time I am in the States. 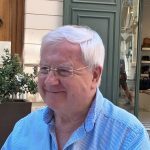 Hi – great to read. I’ve been compiling a list of British symphonies. Would you be able to let me know a list of your symphonies and their dates? I have 1-4 on my list, plus No 9 “Sinfonia da camera”, supposedly written in 1979. That doesn’t fit with the “composer of eight symphonies” mentioned above. If you could clarify for me, I will add the correct details to the list. First of all, a thousand apologies for taking so long to answer (I’ve only just seen you message and it’s now 9th January! – but I’ve had a lot in my mind). I will gladly send you a list of my symphonies (now 14 in number) with the corrected dates of composition, some background and a c.v.